If you've traveled in the Balkans, Greece, Turkey and the eastern Mediterranean, you're probably familiar with a delicious, layered eggplant and meat casserole called 'moussaka.' Moussaka is a dish served throughout this region in countries that were once part of the Ottoman empire. 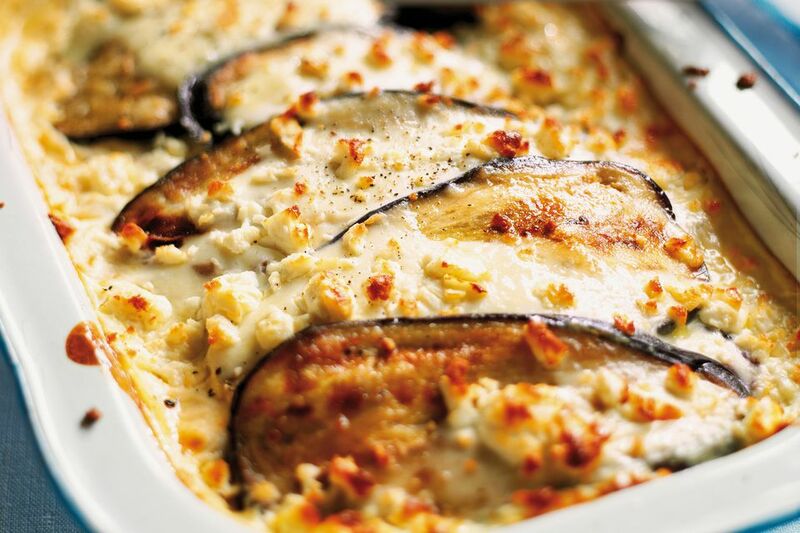 The basic ingredients of moussaka include eggplant, tomato and ground lamb or beef. Each country has its own variations of the recipe. For example, Greek cooks sometimes add red wine or port to the meat mixture, add potatoes and other vegetables to the mix and top the casserole with bechamel sauce and cheese. In Turkish cuisine, 'musakka' is usually made with beef rather than lamb. One type is topped with bechamel and kashar cheese, while the classic version of 'musakka' is topped with sliced peppers and tomatoes in place of the white sauce. This recipe for Turkish-style 'musakka' can be made with or without the white sauce and cheese on top. Simply eliminate the bechamel and cover the top of the meat layer with slices of tomato and pepper before you put it in the oven. Begin by peeling your eggplants. Using a vegetable peeler, begin at one end and remove a strip of peel from end to end. Leave a strip of peel about the same width, then peel another strip from end to end. Repeat this until your eggplant is peeled in a striped pattern. Peel all eggplant this way. Slice the eggplants about ¼ inch thick. Put all the eggplant slices in a large bowl of salty water and let them soak for about 30 minutes. This removes the bitterness. Slice the green pepper into thin rings. Grate the tomato. Peel and chop the onion finely and fry it in 1 tablespoon of olive oil until tender. Add the green pepper slices and continue frying until soft. Add the ground beef and fry until browned. Add the grated tomato, tomato paste and spices. Cover the pan and let the meat simmer for about 10 minutes. Remove from the heat. Grate the other three tomatoes and put them in a small saucepan. Add the tomato paste, salt, pepper, oregano and sugar and let the sauce simmer for about 10 minutes. Remove from the heat. Remove the eggplant slices from the water and blot them dry with paper towels. Fry them on both sides in vegetable oil until tender and golden brown on both sides. Drain them well on paper towels. Line the bottom of a large baking tray with the fried eggplant slices to make a single layer. Make sure there are no gaps between the pieces. Spread the tomato sauce over the eggplant. Next, cover the tomato sauce layer with the meat mixture. In a large pan, melt the butter over high heat. Add the flour and turn it around a few times with a wooden spoon. Add the milk and seasonings and use a wire whisk to make the mixture smooth as it thickens. Your bechamel sauce is ready when it’s the consistency of pudding. Pour the hot bechamel sauce over the meat layer, covering it completely. Sprinkle the grated cheese evenly over the top of the casserole. Bake the casserole in a 360 F/180 C oven until the top turns golden brown. Remove the casserole from the oven and let it rest for at least 10 minutes before cutting it into squares. Serve your ‘musakka’ with Turkish-style rice pilaf.